By Dirk Schouten and Rob Watling. 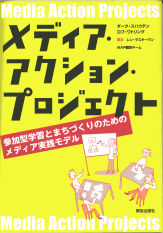 Foreword by LEN MASTERMAN, author of "Teaching the Media"and "Teaching about Television"
January 2006: MAP in Japanese is out! "AH! ERNESTO!" A great short story on education by the famous writer Marguerite Duras. Enjoy it! Teaching by Polarisation by Gert Z. Nordstr�m. A precious text when reflecting on teaching methods. Comments, suggestions and orders for the MAP book are mostwelcome and can be sent to my e-mail address. On this site you can find information on the MAP book and download texts. The texts are about the use of video in education with methodologies related to visual anthropology, qualitative research and communicative action according to Jürgen Habermas' "Theory of Communicative Action". The learning methods used are Freinetian teaching, action based learning and experiental learning. The target groups for this site ranges from teachers to faculty, fromparents to students in various educational settings. In many institutions video is mainly used to serve as ateaching aid in the hands of the teacher or as a tool of indoctrination or oppression. It is seldom an instrument of liberation in the hands of the learners. In our opinion we try to use video as a research tool, as an analytical device and as a production instrument in the hands of the students.In this way students can pursue their own educational goals with the help of a basically powerful instrument. Teachers are the facilitators in this process. This may sound revolutionary. Well, it is not. We have years ofexperience, working with students from the age of 6 to 70. We have been teaching in primary schools and universities in Holland and England.We have facilitated groups in Europe and Africa. All those people had a few things in common. They all had their curiosity and the urge to pursue it. They wanted to find out things about the world around them and wanted to report their findings to others, with the aim to change conditions of lifeand work. Sometimes they succeeded. For all those purposes they used audiovisual equipment;as a research tool and as communication tool and as a change agent. This site contains texts and Media Action Projects background information on the use of video in education. SUMMARY: A basic text on the use of Jürgen Habermas' "Theory of Communicative Action" in communicating with video. The text gives a short introduction to Habermas' theory and applies it to communicating with video.Theoretical and practical shortcomings in the use of video and television in communication are discussed. The text ends with a diagram for critically evaluating programmes on their communicative effectiveness. The text is one of the appendices to the MAP book. SUMMARY: When video is used as a change agent in social processes, themethod of making video feedbackloops can be useful. In this text I describe theoretical issues and give some practical advice. This text also appeared in Slovakian in: PREDPOKLADY ZAVADZANIA ISO 9000 NA SLOVENSKU. ISBN 80-967048-3-4. SUMMARY: In this article, Hugo Letiche and Dirk Schouten report on a research project carried out in Eastern-Europe's Slovakia. Business School students from Erasmus University in Holland and the School of Economics in Bratislava, Slovakia, jointly researched 'quality' in Slovakian factories. They used video as a research tool, applying theoretical and practical notions and methodologies used in visual anthropology and action based learning. The text was part of a presentation on Summit 2000 in Toronto, Canada, May 13-17, 2000. SUMMARY: In this paper, given for the Council of Europe on a workshopon cultural minorities, Dirk Schouten presents a model by which the right toinformation can be exercised by groups; a class in a school, agroup of adults, a group of young Turks, a group of migrantsetc., etc.. The model describes procedures and indicates ways toenable the individual to integrate into the local community withthe support of audiovisual means. Some of the basic assumptions that support the model and indicate some of the advantages if using it, will bedescribed. The model is constructed on three pillars: Research, Analysis andProduction. The model has been used over a number of years with hundredsof different groups in Europe and Africa. Working with the model not only convinced the author that it adequatefor producing audiovisual material on a truly democratic base, but that is also a good instrument to exercise the right to be a member of a society.Examples are given to illustrate the model:The first example is about a class of primary school children living nearbySchiphol Airport (Holland), doing research on the effects of the airport ontheir lives.The second example deals with a defined environment; the world of theTurkish entrepreneur. Turkish entrepreneurs are seen as 'natural' entrepreneurs, but a lot of them fail because there is a lack of understanding about contradictory regulations and Dutch bureaucracy. The use of video combined with feedback loops plays an important role inestablishing contact between the various stakeholders involved in theproblems of Turkish entrepreneurs.The text also gives some information on the principles and philosophies thatunderpin the model: The German philosoper Jürgen Habermas an his theorieson communicative action and the French postmodernist Francois Lyotard withhis concept of 'le differand'. SUMMARY: In this text background information is given on the Frencheducatonalist Celestin Freinet and the Brazilian pedagogue Paolo Freire. The basic principles of Freinet education are given and made tangible by an interview with Arno Hokke, principal of a Freinet School in Holland. This text is an appendix to the MAP book. TITLE: Students Make Audiovisuals Themselves: How it can be done. SUMMARY: An early text on the 'Eerbeek Model'; the predecessor of the MAP model. WORKING TITLE: Using video in as an instrument in communication, applying feedback and feedforward. SUMMARY:Feedforward seems to have unseen possibilities when used in communication with video. The text is under constructions. When you are interested in this kind of stuff and maybe willing to participate in experimenting with the described methods, email me. Dimensions: 21 x 30 cm (landscape). 92 pages. Paperback, full colour cover, with illustrations, diagrams and flowcharts. PRICE: $ 20 or 20 Euro (p & p included). Ordering: Write an e-mail and I will contact you onhow to get the book ASAP. The MAP book can also be obtained in the U.S.A. via Great Plains National (GPN), one of the country’s largest and most respected educational product distributors located at Nebraska ETV at the University of Nebraska in Lincoln. Media Action Projects is a new practical guide forteachers, pupils and parents who want to use video ineducation, training and community development.The clear twelve stage model helps facilitators and teachersto support groups as they research, produce and showaudiovisual texts. The model has been used succesfullythroughout Europe and Africa in settings ranging fromprimary schools to universities, from community groups toliberation movements. Beginners can use this book to develop the skills insupporting practical media work. They will also find ahands-on course to help them become resourcefulfacilitators. Experienced media users will find here a newapproach which will enable them to support more groups asthey produce real texts about issues of real importance. Fullof new ideas and practical examples, this book represents adefinitive break with conventional media practices. There is"... nothing in the available literature to compare with it". I was in Dirk Schouten's debt even before I had met him. In 1986 he had devoted much time and intellectual energy totranslating some of my own work into Dutch and in thefollowing year he arranged for me to teach a series ofworkshops at his college in Eerbeek, outside ofAmsterdam. It is easy, of course, to warm to one who hasworked so hard on your behalf, and not surprisingly theDutch workshops turned out to be relaxed and convivialaffairs, and Dirk Schouten the congenial host I hadexpected. What I hadn't anticipated was the originality and rigour ofDirk Schouten's own teaching, particularly in that areawhere such qualities have been in notoriously short supply,that of practical media work. He and his colleaues hadsomehow managed to get young working-class adults whohad been alienated from education producing photo-books,radio programmes and video-tapes about their lives whichwere of astonishing honesty and accomplishment. And thetapes I saw on how groups of students had gone abouttheir work -their planning, discussions and decision-making- was as good an exemplar as I had ever seen of democraticvalues at work in education. In short, I returned from Holland having learned much morethan I had given, and determined both to find out moreabout the processes which lay behind Dirk Schouten's work,and to make these available to other media teachers asquickly as possible. Accordingly I partly returned hiscompliment to me by urging him to write up his work, andproduce an English translation of it which I would try todisseminate. This monograph, after too long a delay, is theresult of that request. It would not have been produced,however, and certainly not in its present form, without thecommitment and application of Rob Watling - of whommore later. When Schouten's manuscript arrived, even I was astonishedby its detail and coherence. I had expected some originalideas and approaches, illustrated by practical examples. What I received was a comprehensive account of a twelve-stage model, which had been practically thought through andtried-and-tested over an extended period of time, and in avariety of educational settings. Here was nothing in theavailable literature to compete with it. In its theoreticalrigour and in the richness of its empirical detail it was outon its own, a genuine original. But the very uniqueness and completeness of Schouten'smodel presented some problems. First of all there weredifficulties of language. Schouten's English translation wasexcellent, but it was a translation nevertheless with rhythmsand cadences unfamiliar to British ears. More importantlySchouten had been compelled to hammer out a distinctivevocabulary to describe what he was doing, and to signalsignificant breaks with more conventional practices. Thiswas a language which Schouten had internalised. He used itnaturally. But it presented some barriers to those coming tohis work for the first time. Finally, Schouten's examples,taken largely from his most recent work with adultcommunity groups, did not entirely 'fit' with the situationsof those teachers whom I wished to reach, media teachers inBritish schools and colleges. At which point, enter Rob Watling a British mediaresearcher who was carrying out an international review ofpractical media work in 1992, and who was bowled over, asI had been, by Dirk Schouten's work. Watling travelled toHolland to gain first-hand experience of the Eerbeek model,and since then has collaborated with Schouten on a numberof projects in Holland and Britain. He has adapted themodel with a wide range of British groups in primary andsecondary schools as well as in colleges and universities. Watling's achievement has been to take Schouten's originalEnglish draft and present it in a style and with exampleswhich make it as accessible as possible to British teachers. What a British readership will find in these pages is anaccount of practical media work which brings togetherqualities we have come to think of, during the 80s and 90s,as educational polarities: it is democratic, yet rigorous;creative, yet systematic; original, yet well-tested; reflectiveyet active; practical but not technical; progressive yetdelivering high standards. Media teachers won't have to adopt Dirk Schouten's modelin its entirety to benefit from his work. Even his asides -on keeping technique in its place; on predicting andmanaging stressful situations; on the significance ofresearch; on preparing for interviews; on avoiding theshooting of too much material - if heeded, would improvethe quality of most practical work beyond recognition. But what strikes this reader most forcibly about the workdescribed here is its refinement of educational qualitieswhich have been rendered almost literally foreign to us overthe past ten years by our now over-centralised andoverprescribed curriculum. Anyone, of whatever politicalpersuasion, watching the videotapes of Schouten's studentsat work, would attest to the democratic and educationalvalue of the processes they are engaged in. Yet theyassume the primary importance of students' own ideas, theinvestigative nature of real learning, the possibleparticipation of parents, the linking of educational work withcommunity action, a high degree of student control overtheir own learning, indeed a whole panoply of educationalapproaches which are now virtually out-of-court for Britishteachers. Their re-emergence, in however tentative a form,and the re-opening of a debate about the nature of a high-quality democratic education is long overdue. I hope thatthis monograph will not only be a fitting tribute to DirkSchouten's work, but provide a relevant starting-point forthat debate. Len Masterman. Wirral, UK, August 1997. This booklet offers a systematic way of working forteachers, parents and pupils who wish to undertake practicalmedia work (particularly video and audio-visual texts) ineducation, training, community development and similarsettings. The model has been developed over a number ofyears since its conception at the Folk High School inEerbeek, Holland, and provides an organisational structurewithin which groups can identify both their goals andsubprocesses for archieving them. Len Masterman has been of great support to this project.Without his contributions and encouragement this Englishversion would never have seen the light of day. Thanks arealso due to all the people, parents, teachers and pupils whocontributed to the model for their support. It has now beenused with a wide range of groups from primary schoolpupils to unemployed young people and with communitygrouos throughout Europe and in several African countries.recently it has been used on a number of courses andresearch projects at the University of Nottingham,Amsterdam Polytechnic, and Erasmus University,Rotterdam. The booklet refers to several of these projects,though we have altered some of the details for the sake ofanonymity and clarity. Our experience of using the model in such a wide range ofcontexts convinces us that there is something of great value atthe heart of the process: students are made powerful in theclassroom and come to use that power in positive andpurposeful ways. In some countries there is undoubtedly atide that is running against this sort of process. But tideschange, and we remain committed to the right of people toengage with issues which they know to be important. Dirk Schouten is one of Europe's most innovative mediatrainers. He has worked as cameraman, editor and soundengineer for many of the Dutch broadcasting companiesbefore studying at the Dutch Film Academy where hemajored in 'Media i n Social Processes'. Since that time hehas worked as a media-facilitator for UNESCO (consultanyand media projects in Portugal, Austria and Nepal),Leiden University (Dept. of Clinical Psychology), ErasmusUniversity Rotterdam (Faculty of Business Administration),the Amsterdam Polytechnic (Master of Education),Nottingham University (MEd) and many others, varyingfrom liberation movements in Zambia to universities in Poland and Slovakia. Most of the groups he facilitates use video as a research toolin projects aimed at changing conditions of life and work.He has published articles on a variety of subjects includinglocal radio and television, media-education and innovativeuses of media. His latest projects are about the use ofvideo as a "feedforward" tool in facilitating organisationalchange. Dr. Rob Watling is a Research Associate at the Universityof Nottingham School of Education. One of the UK'sleading experts on practical media work, he has over 20years experience of using video, photography and film ineducation and community work. He has worked as adramatherapist, community development worker, and mediatrainer - always promoting media activity in communitiesand political movements. After studying English andFolklore at the University of Stirling and Media Educationat the Polytechnic of Wales, he wrote his PhD at theUniversity of Nottingham on the links between practicalmedia work, education and community development. he hastaught on innovative media courses at the West GlamorganInstitute of Higher Education, Nottingham Trent Universityand the University of Nottingham. He writes regularly forpractitioners and academics, and has lectured on his workthroughout the UK as well as in Spain and France. Heintroduced the use of Media Action Projects to the UK, andhas developed powerful new uses for the model in Action-Research projects and in the evaluation of urbanprogrammes. His most recent research in this field had beenfunded by the Economic and Social Research Council, theEuropean Social Fund, and the Joseph Ro wntreeFoundation. The NAA (Nederlands Audiovisueel Archief/ Dutch Audiovisual Archive) produced a catalogue on Dirk's work as media teacher. Most of his work is now in the archive and availablefor research purposes. MAP went to Summit 2000 in Toronto. Dirk gave a lecture and did a workshop with 12 pupils from a Toronto school. These pupils were the only young contributors to a worldwide conference bearing the title: Children, Youth and the Media in the new Millenium. is up an going from February 2000 on. Now there is an easy chat facility for MAP users all over the world. The FAQ is still small. It will become bigger and bigger as faciltators, teachers, students and pupils come up with questions and answers. Keep an eye on the MAP-FAQ! - Credit card orders and purchase orders(education/government) may be faxed to (323) 931-4474. - Or mail your order to the address above. People may e-mail the center atorders@medialit.org to request an order form. Please do NOT send the Center an order via email.